You are not alone... it's a WE Program! What a wonderful way to remind ourselves just how important the fellowship of this program is to our recovery! A perfect gift for sponsors, sponsees, or anyone in recovery! With each click of the button, your Recovery Pen rotates through some of our favorite recovery slogans. Message 1: One Day At A Time - First Things First. Trust God, Clean House, Help Others. Message 2: Unity, Recovery and Service To Keep it, you have to give it away. Message 3: Keep coming back! It works IF you work it! Don't quit before the miracle happens. Message 4: We had to quit playing God... Let go and Let God! Live and Let Live! Recovery Pens have a slightly thicker body than most plastic pens. They feel great and write even better! 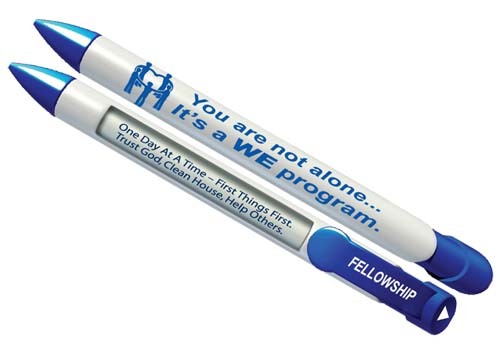 All Recovery Pens are 1mm ballpoint, retractable pens with black ink. 1-49 pcs. = $ 1.99/ea. 50-99 pcs. = $ 1.49/ea. Click HERE for 36 Pen Canister Sets! Bulk Discounts and Customization Available.